Pesticide MRL establishment not only protects the integrity of the food supply, but also protects domestic agriculture. China’s response to WTO TBT/SPS notifications varies depending on the impact on trade balance, the value of the commodity, existence of established MRLs and China’s overall trade relationship with the notifying country. Member countries are required to notify other countries of any new or revised regulations which affect trade and to set up offices (official enquiry points) to answer requests for more information on new or existing measures at the WTH level. In regards to pesticide, TBT includes pesticide/chemical registration regulations and measures concerning food safety, production, environmental and labeling, etc., while SPS is more on MRL establishment/amendment/exemption/cancellation, crop grouping and other agricultural or technical practice for pesticide uses. China participated in the WTO TBT/SPS notification activities as early as 2003 and has formed a mature response system to support international trade of agricultural products, protect its domestic agricultural production and consumers. Through the introduction of official comment on MRL notification and studies of recent cases, this article aims to demystify how these WTO MRL notifications impact China's national pesticide MRL establishment. 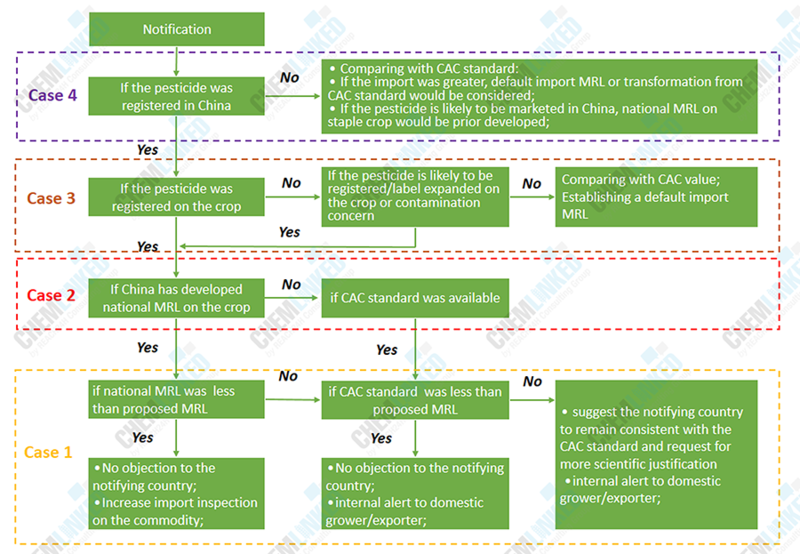 In the last 2 years, China has made very few WTO notifications on new enactment or amendment of pesticide regulations and the majority of these notifications involved establishment, amendment or cancellation of pesticide MRLs. An official inquiry point was established at the National Quality Standardization Center of Agricultural Product under the MoARA (Ministry of Agricultural and Rural Affair), receiving notifications from 19 countries/regions including the US, EU, Brazil, Canada and New Zealand etc. Each notification will be sent to relevant government body/institutions covering pesticide management, trade, economic and administration, etc. and expert opinions will be collected and concluded at CCPR Secretariat (a branch office of ICAMA) and then submitted to the national inquiry point. Case 1: Notified pesticide was registered on the crop/commodity in China and established with corresponding national MRL. On 18 May 2015, Canada proposed a new MRL of deltamethrin in tea of 7.0 mg/kg. Deltamethrin was registered in China on tea and various crops such as peanuts, maize, apple, pear and citrus, etc. and a national MRL in tea of 10 mg/kg was established, which is greater than international MRL of 5 mg/kg and the proposed MRL in Canada. The national MRL was transformed from GB 2763-2005, at a time when China had not gathered sufficient scientific data. China’s tea importation from Canada was around 60,000 USD in 2015 but the exportation to Canada reached 1.26 million USD. Experts therefore issued a trade alert highlighting potential disruption to domestic tea exporters and requirements to make future amendment to national MRL. 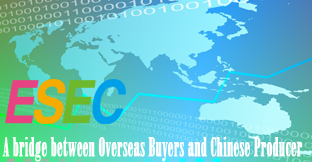 If China’s export to the notifying country was greater than the import from the country and the national MRL was greater than the proposed MRL, comparative analysis on CAC standard will proceed. On an international level, China will suggest the notifying country to remain consistent with the CAC standard and request for more scientific justification. Nationally, domestic tea growers and exporters will be alerted to increase quality inspection and national MRL would be amended or renewed. If China’s national MRL was less than the proposed MRL or CAC standard, for example, the national MRL of deltamethrin in apples and pears was 0.1 mg/kg, which is less than CAC standard (0.2mg/kg in apple) and EU standard (0.2 mg/kg in apple and 0.1 mg/kg in pear). If the notifying country proposes a higher MRL, import & export management department will be prompted to increase import inspection on the commodities from the country. In 2015, Canada filed the notification G/SPS/N/CAN/943 to propose a fomesafen MRL in potato of 0.025mg/kg. In China, fomesafen was registered on various crop including soybean, red bean, mung bean, peanuts, strawberry, tomato and potato, etc., but only part of these crops/commodities have been established with national MRLs. The herbicide is allowed to be used on potato but has not yet had a national MRL established. In trade balance term, the value of potato import was modest and export was also negligible. China raised objection to the notification because the impact of Canadian MRL was negligible. If the trade flow of the commodity was considerable, a default MRL for all imported commodities not yet established with national MRL would be considered. In 2015, Taiwan region filed the notification G/SPS/N/TPKM/368, proposing a zoxamide MRL in grape of 0.02mg/kg. In China, the fungicide was registered only on cucumber but a national MRL in grape of 5 mg/kg was established. No registration on grape signifies that uses of the fungicide on the crop was illegal in China. Pesticide registration authority would be required to investigate the actual use status and whether any pending registration application exists. If the fungicide was actually used in China, domestic grower and exporters will be alerted. If not, cancellation of the national MRL will be suggested and default for imported commodities not yet established with MRL would also be considered. In 2015, notification G/SPS/N/CAN/933 was filed by Canada, proposing a sedaxane MRL in mustard seed of 0.01mg/kg. China’s response team investigated that sedaxane was only registered on maize and wheat but none of these commodities have been established with a national MRL. Since there is no uses of the fungicide on mustard, China raised no objection on this notification. But lawmakers are urged to accelerate MRL development on registered staple crop/commodity.